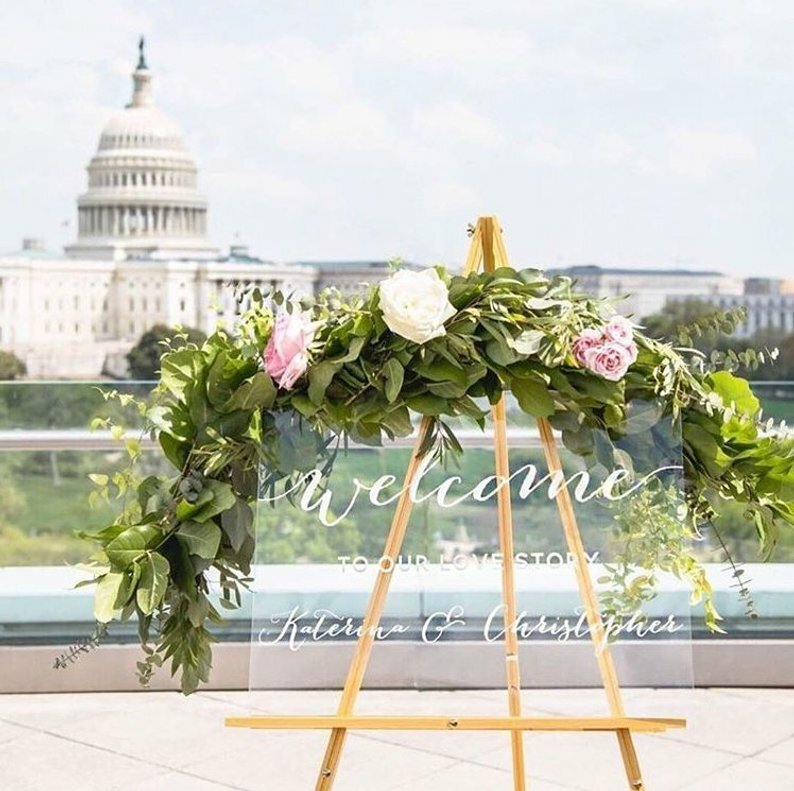 Acrylic wedding signs grew in popularity last year and in 2019 acrylic seating charts are set to be one of the bigger trends. It’s clear to see why these signs have taken off in popularity! 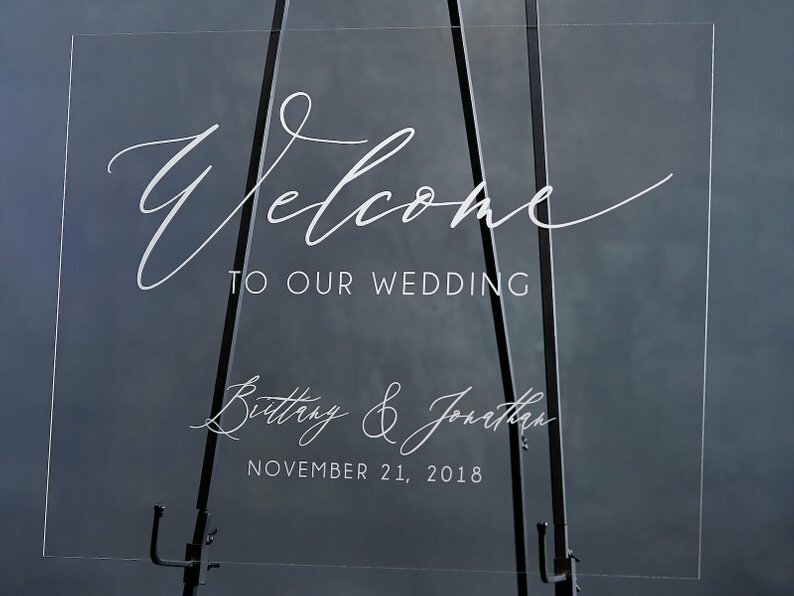 These glass / clear / acrylic wedding welcome signs and seating charts are classy looking and add an interesting textural element to the wedding ceremony or reception space. 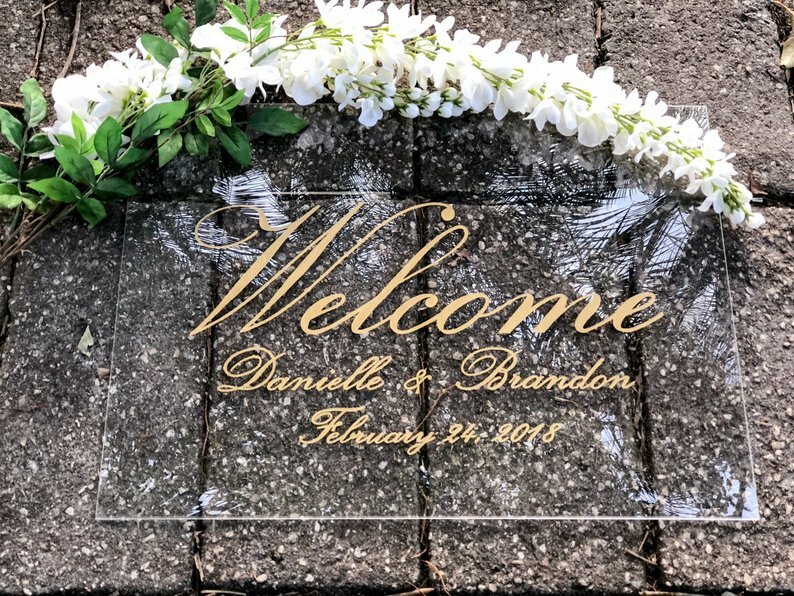 Acrylic is a fantastic material for wedding signs since it is rigid enough to stand on it’s own, or can fit in a frame, or and be dressed up with floral arrangements. 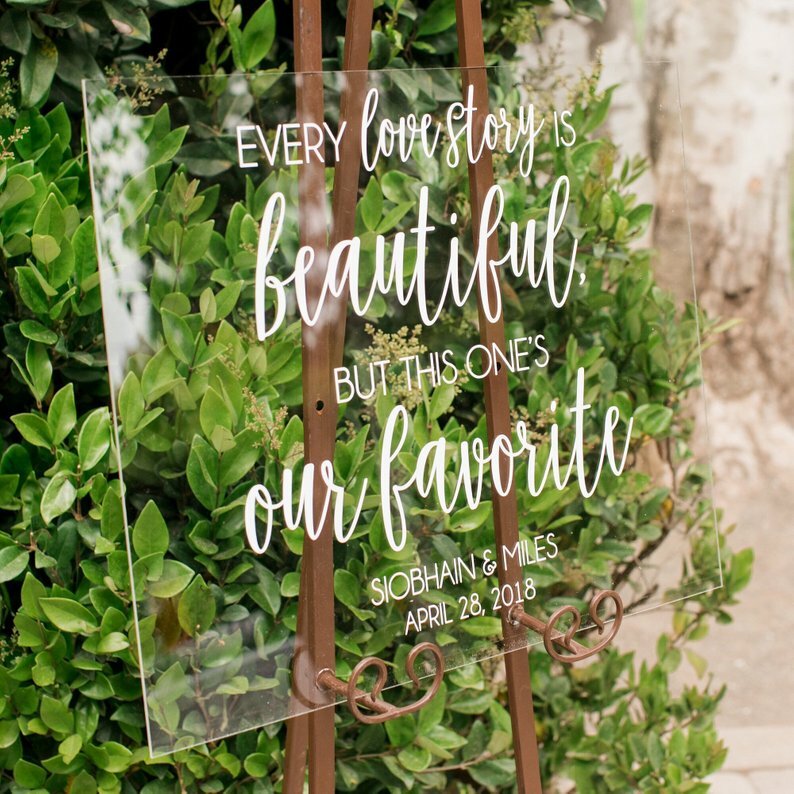 Today we’re sharing some of our favorite acrylic wedding signs and clear wedding seating charts! 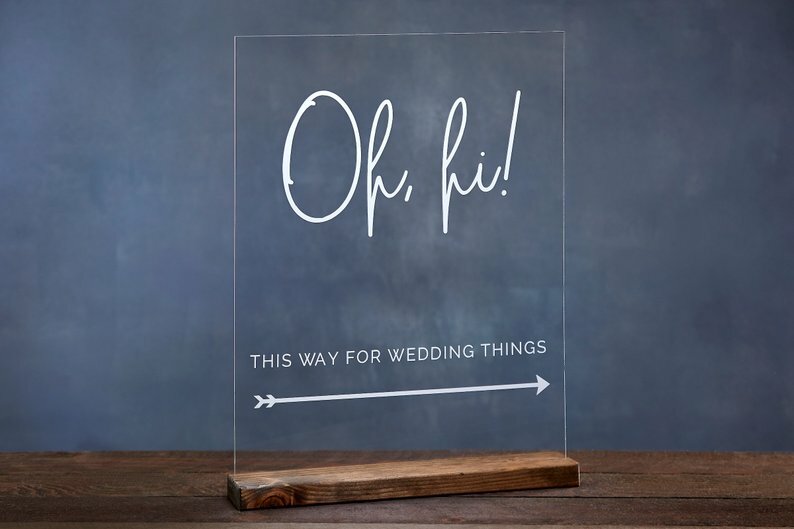 Welcoming your guests to your wedding with an acrylic sign is the perfect way to set the mood. 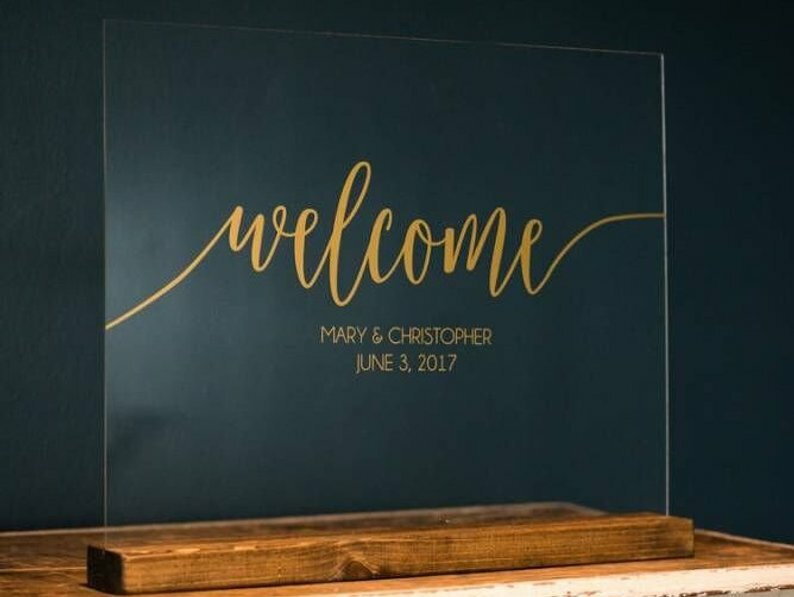 These gorgeous wedding acrylic signs by Woodland Custom Designs feature hand-letting in your chosen color to welcome guests to your wedding. Each wedding sign they make is made custom on high quality acrylic either 18×24″ or 20×32″ with a thickness of 1/8″. 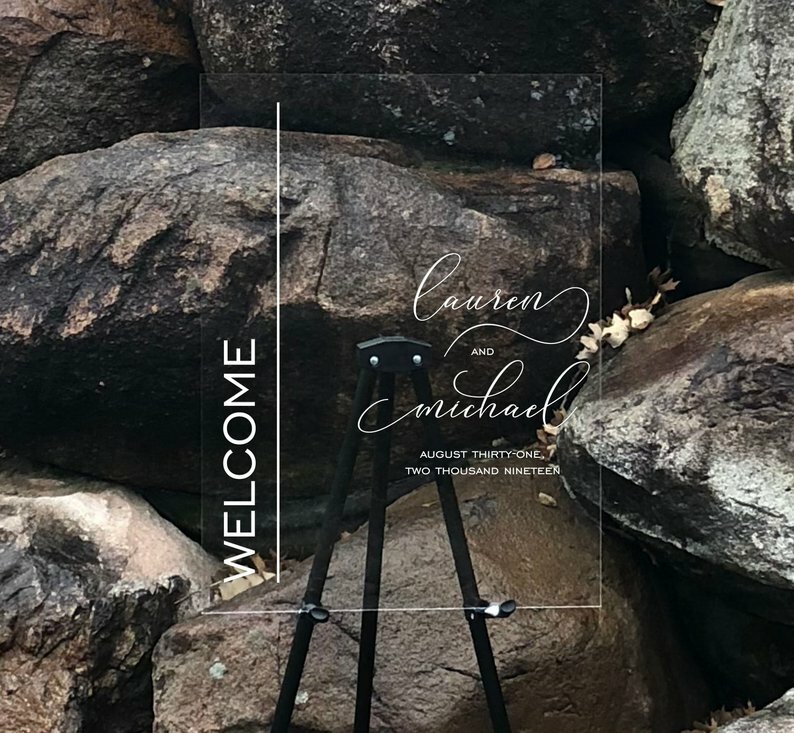 Rich Design Co offers a variety of acrylic wedding welcome signs and other wedding signs on acrylic, perfect for welcoming your guests on your big day. Signs are weather and smudge resistant so you don’t have to worry about any conditions! Adorning Oaks offers an acrylic wedding sign with white paint on top and a beautiful wood frame. 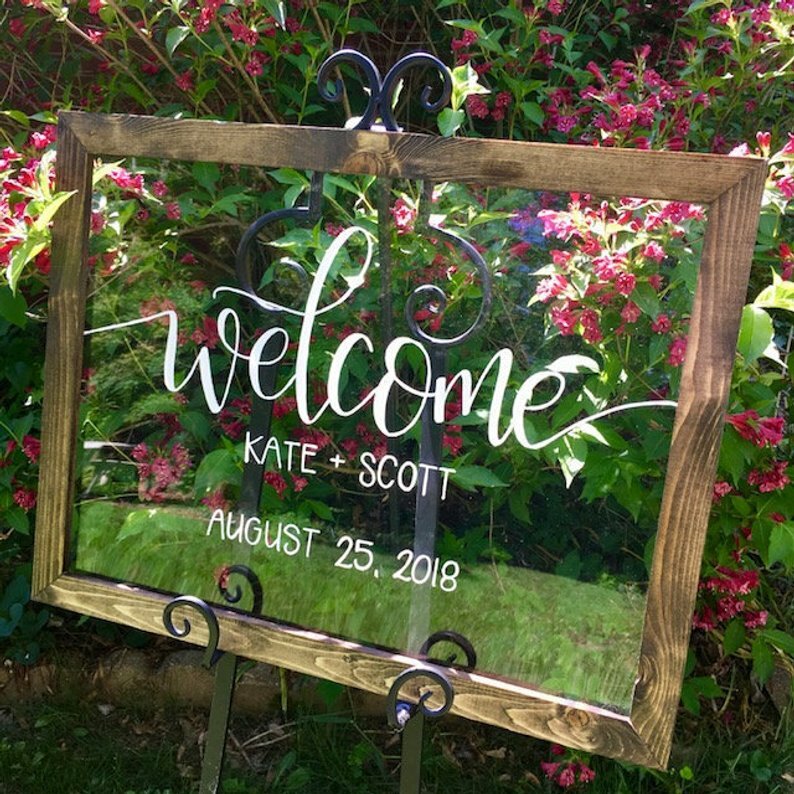 It’s a perfect way to welcome guests with a personalized sign finished off by a dark wood frame. 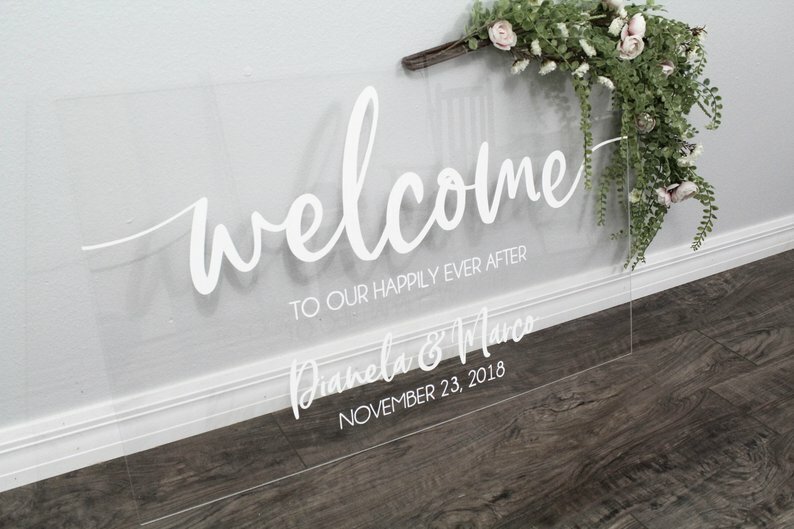 Paper Supply Station offers acrylic wedding signs in unique, eye-catching styles. These signs are made from engraving on sturdy acrylic for a glass-like effect that will never fade or scratch off and is weatherproof. 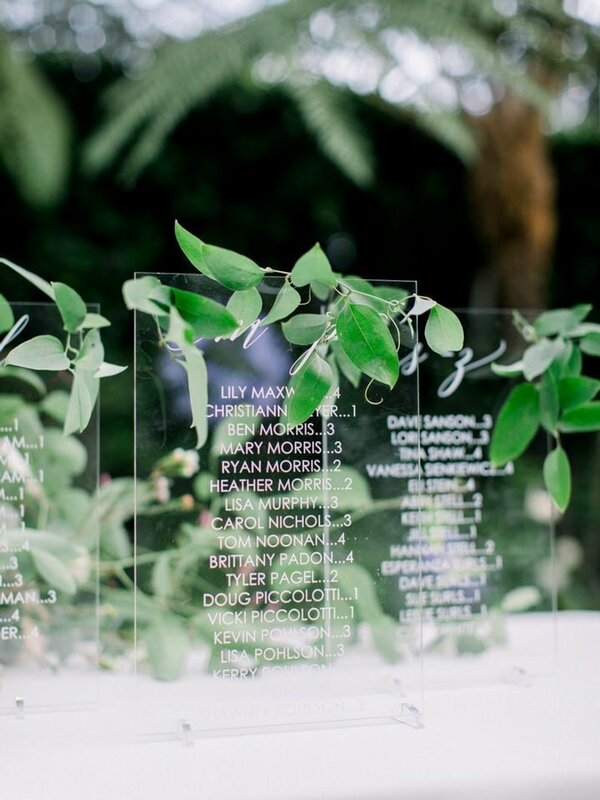 Not only does acrylic make a great opening statement at your wedding but it offers a beautiful option for wedding seating charts. 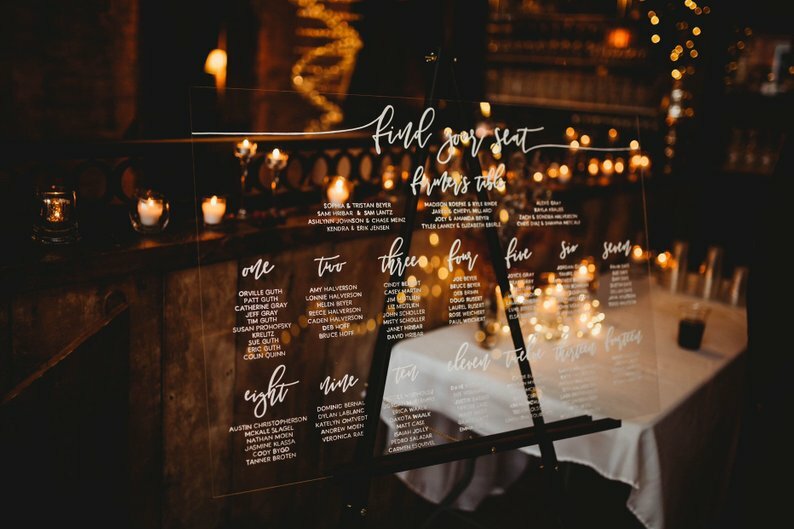 These beautiful acrylic wedding seating charts by Woodland Custom Designs are each hand painted on high quality acrylic. Signs are customizable with your wedding seating plan and style. 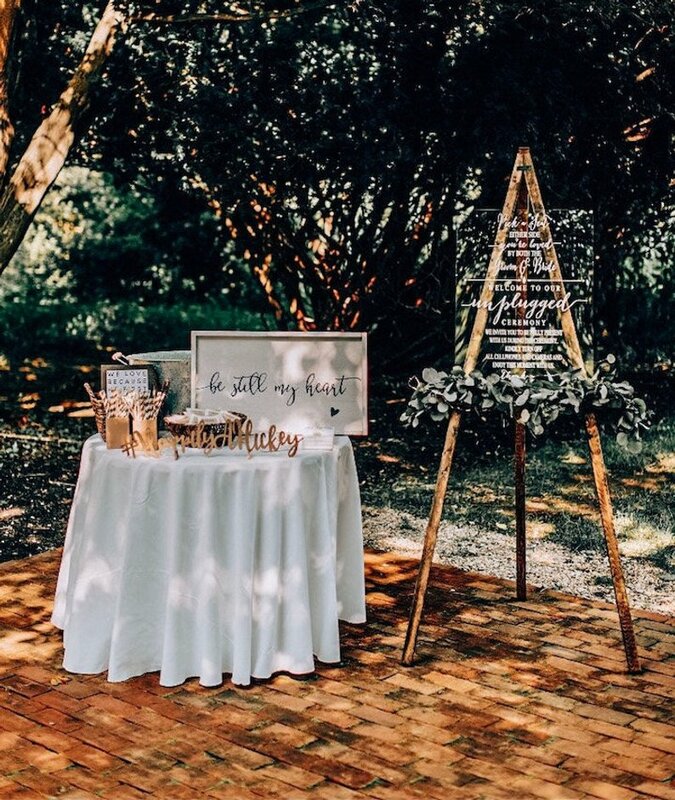 The hand calligraphy and clean lines of an acrylic sign on an easel are perfect for modern, minimalist weddings. They also work fantastically at outdoor weddings or rustic weddings where wood is a big feature. Paper Supply Station also offers wedding seating charts in different size options. You can choose from a large seating chart on acrylic or smaller seating charts that measure 12″ tall and 8″ wide. Text is engraved into clear acrylic for a transparent, glass effect that makes it look like its floating. 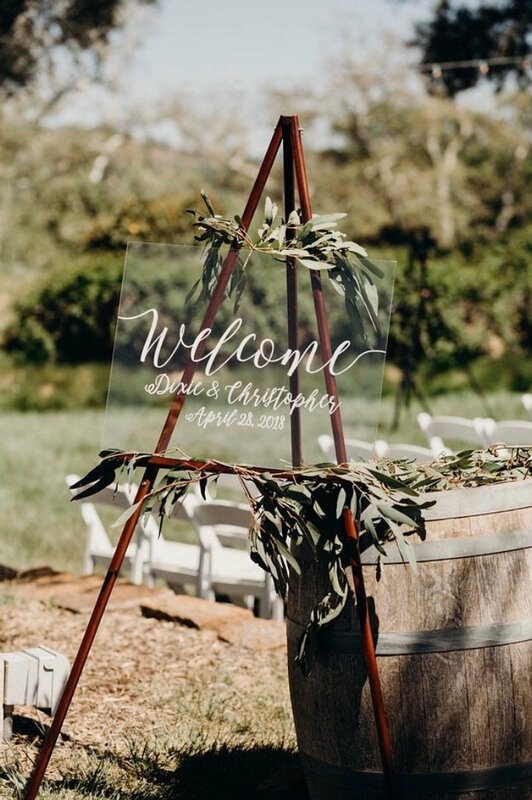 Where to buy an easel for acrylic wedding signs? 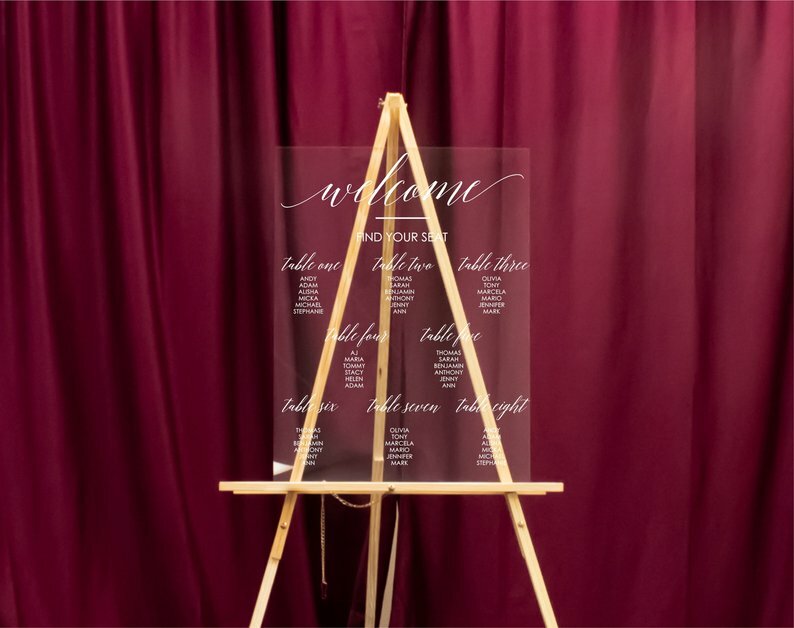 Due to the popularity of acrylic signs and other welcome signs at weddings, many venues now offer easels as part of their decor or standard package. 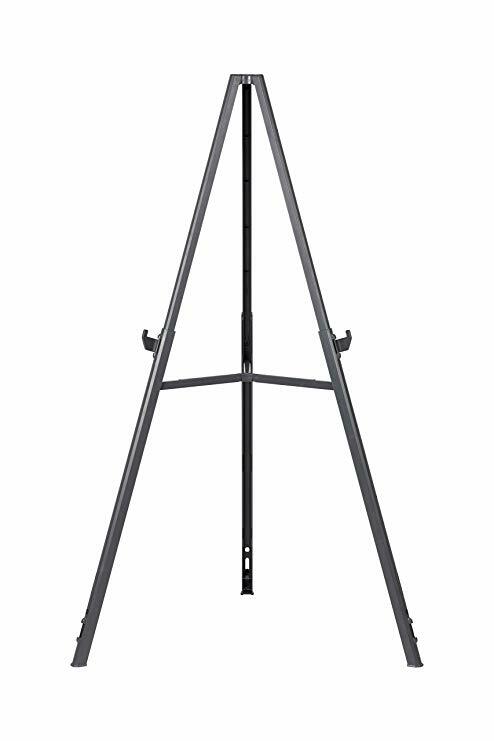 If your venue doesn’t have one to rent you can purchase an easel for online for a very reasonable price. There are a variety of options available both on Amazon and Etsy. Here are a few favorites. You might consider this easel which is under $35 and holds up to 25 pounds. 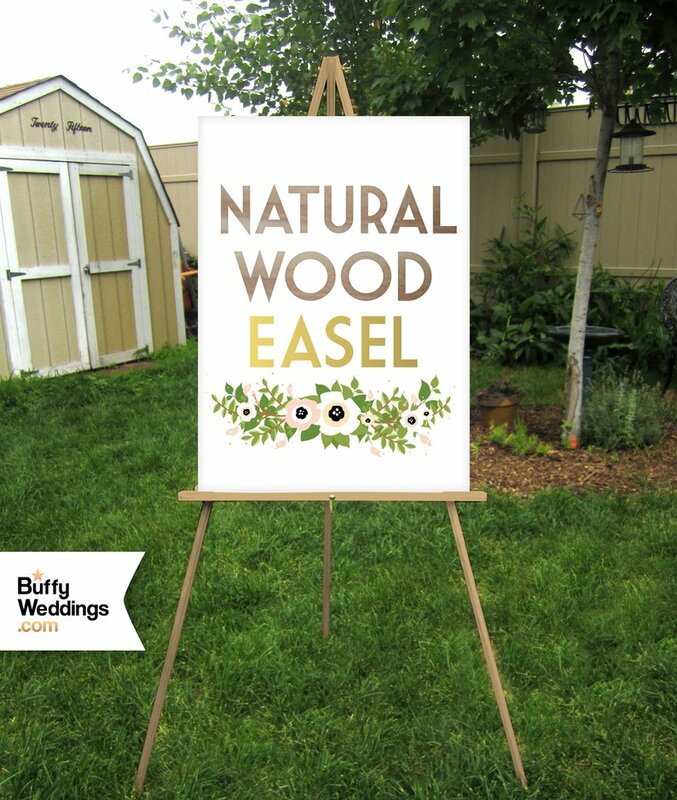 Buffy Weddings offers multiple wood easels in a variety of shades and painted colors. Patriot Crafted also offers a variety of easels for acrylic wedding signs including rustic wedding easel stands and white washed wood easel stands. 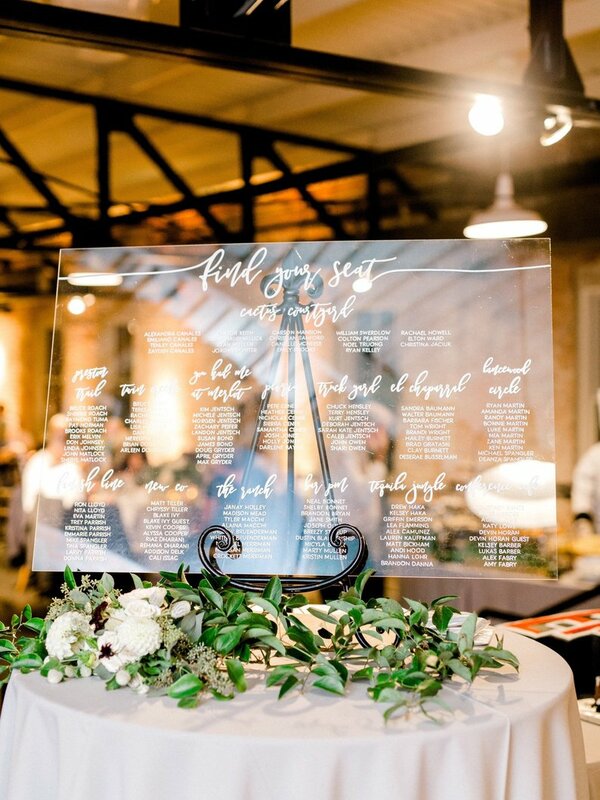 Hopefully these acrylic wedding signs give you an idea for your own wedding decor!